Points of Light Music is happy to be partnering with Dances DSM to organize another Dances of Universal Peace retreat with Anahata Iradah in late April 2019 at Newton Christian Conference Center, Newton, IA. Anahata Iradah is a senior teacher in the Mentor Teacher’s Guild of the International Network for the Dances of Universal Peace. 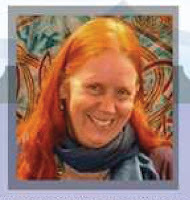 She is a gifted musician, teacher, composer, songwriter, meditation teacher, DVD author and documentary film producer. The revered Buddhist teacher Shinzen Young has been her personal guide in the path of Vipassana meditation. With his encouragement she has combined the Dances of Universal Peace and Buddhist meditation techniques and teachings. 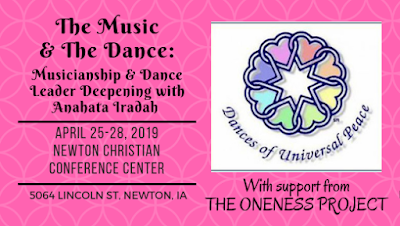 Much like the retreat within a retreat Dances DSM organized in 2017 where dance musicians and leaders had a skills deepening retreat that surrounded a shorter Dance retreat, this weekend will be structured similarly with the Dance Retreat lead by Anahata starting Saturday afternoon, April 27 and ending at lunch on Sunday, April 28. 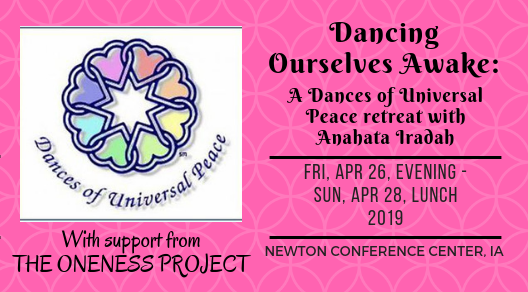 Dancers can add on a Friday evening dance circle lead by dance musicians and leaders attending the skills deepening retreats and Saturday morning activities including a dance circle, group mandala stone painting, or personal free time. For more information about fees, lodging, meals, registration, and more, click here. The Musicianship retreat, The Music and The Dance, begins Thursday afternoon, April 25 and end after a closing circle on Sunday afternoon, April 27. For more information, click here.